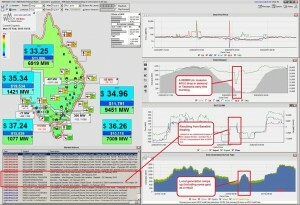 Earlier today Paul McArdle posted an article on WattClarity that explained a significant drop in Tasmanian demand at 1:05 dispatch. Yesterday RenewEconomy posted an article on a video made by Ketan Joshi. The video (below) tracks the live NEM-Watch widget on the RenewEconomy Homepage over one week.